I’ve been slack in my comic reading lately, which is weird for me. So, between the library and a couple of comic store trips, I’ve been trying to remedy that. Here are my thoughts on a few of the books I’ve been reading lately: This One Summer, Say I Love You, and Seeing Red. Rose and her family are traveling to the lake this summer, like they do every year, and she’s excited to see her friend Windy, another girl a couple years younger than her. But this year things are different: her mother is depressed after failing to have another baby, her parents won’t stop fighting, and a local scandal involving a teenage girl wends it’s way through Rose’s life. All through that, she’s starting the horrible transition out of childhood. 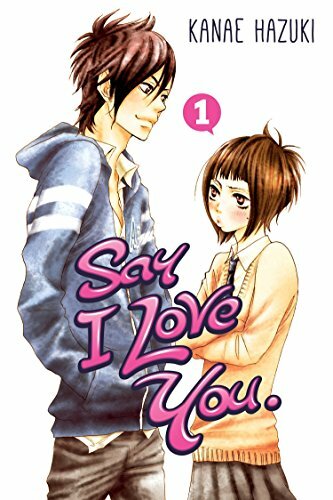 Mei is a friendless loner, but then the handsome popular boy Yamato starts paying attention to her and things change. She gains friends, even rivals, and she starts to come out of her shell as she realizes that sometimes she can trust people and ask for help. I’d heard great things about the anime, and also the story sounds so similar to Kimi ni Todoke, that I felt I had to check it out. The relationship certainly progresses much more quickly, as they kiss by the first chapter (it takes SO LONG for that to even start to happen in KnT). Mei’s quiet but still kind of standoffish attitude of course makes everyone hate her for being with the popular boy, and it doesn’t take long for a rival, in the form of the only girl Yamato slept with, to show up. I like the characters, and Mei’s ability to get people to understand how to interact with people (based on her experiences of everyone interacting badly with her) makes for a story that reaches beyond her own problems. But, I couldn’t get as invested as I would have hoped, partly because the story moves a little too fast. Also, Yamato, while generally sweet, is a little more forceful with Mei than I’m really comfortable with. I don’t think I’ll be compelled enough to keep up with this series. Marceline forgot her bass at her dad’s house, so she goes back to the Nightosphere with Jake to endure a family reunion and get it back. So, I love Adventure Time. And I love Marceline. Plus I already own the other books in this series featuring various lady characters, so I had to get this volume. Focusing on one of the bigger problems in Marcy’s life — her dad — she gets back home to find that her bass is gone, and that her dad actually stole it and sold it, sending her and Jake on a trail to get it back. Being in black in white, it’s missing all the bright candy-coated colors from the show, but the scenes are still detailed and full of varied character designs, including awesome frequent costume changes by Marceline. I like Sterling’s panel layouts, too, which are big enough to allow for the aforementioned detail and slow down the story enough to keep it from being too frenetic. The story gets a little cheeseball at the end (though that’s fine with me), with a touching scene between Marceline and her father showing that he may not understand his daughter’s motivations, but he still wants to try to make her happy. I also love the bonus story, in 4-koma style, of Lumpy Space Princess going on a quest for the hottest purse. Nice tough. These are some of the comics I’ve been reading lately. Have you read any of these? What did you think? What other comics are you into right now?